Why did Mojang waste so many block IDs when they knew they were going to run out? So why did Mojang not do this? This applies even moreso to some other blocks, particularly Shulker boxes - which could have used a single ID; they are already tile entities so they could have easily used tile entity data to store their color; stacking different colors is not an issue since they are already unstackable, nor can you stack items with different NBT data. If I had added new types of fences using new block IDs I'd have had to modify every single instance like this (a lot) in order to check for every type of fence block but this way they are all grouped together into a single block; this includes the rendering code, where adding a bunch of additional checks could slow things down (I could use "instanceof BlockFence", which would also include Nether brick fences, but then it would break Optifine compatibility as I'd have to modify a class it modifies). // will not render properly. 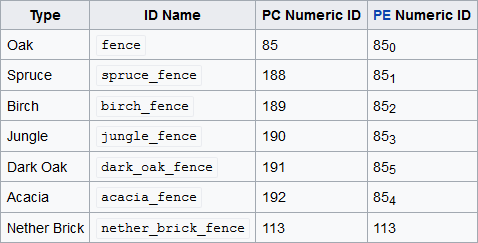 According to the Minecraft wiki page on fences, it appears that they use the data value for the connection direction (1 bit each for N/S/E/W), so they had to use separate blocks for the fence material types. Personally, I think it was a mistake for Mojang to not bump the data bits up from 4 to 8 during one of their major world format organizations (such as when they implemented the McRegion format). Having 8 data/damage value bits would have consolidated lots of blocks that have both a material type and other requirements for the data bits. It's called "creative workaround", it's a practice among all developers (but particularly among game developers) that figures out unintended or unplanned ways to use the tools they have available to push out a feature on a sooner rather than later basis. All kinds of relatively impressive speed improvements were implemented in this fashion, wringing out even more use from the very tight 64k byte limit that existed in the days of DOS; nowadays, with far more wiggle room to waste with bloated implementation of bad code, it's more about dealing with new or unplanned-for extensions to an overall idea in ways the code was not intended to be used. This inserts small problems (bugs, design flaws, etc) that grow bigger and bigger until the developer simply has to stop and deal with it all at once. This is basically the whole concept around the 1.13 Minecraft update, which is pretty much just invisible bugfixes and optimizations that the player is never going to see. This is not true though; MCEdit shows the data value of fences as 0 regardless of orientation (this is true not only for 1.6.4 but for 1.12.2, so the change to blockstates in 1.8 did not change the underlying data), and their appearance is solely determined during render time; when rendering a fence the game uses the blocks surrounding it to determine how they should be rendered and this data is not stored anywhere. I did not have to change anything other than making the texture depend on the data value when I added more variants, and if the game internally used it for other purposes they wouldn't render correctly, plus the number of data values needed exceeds the number possible (in order to have 4 variants of fence you'd need 6 bits since there is one "virtual" bit used for each direction a fence may connect in, 4 total, then you need 2 more bits for the variant). The only issue I ran into had to do with the way the game rendered fences as items; it treats them separately (different render function) and the render function used to render a fence as an item ignores the data value (which is passed into the main render function), and since I did not want to modify code that Optifine modifies I added in a field to my BlockWoodFence class and set it to the appropriate value before rendering the item (it must be set back to 0 afterwards or blocks will have the wrong textures). 1) If it was known internally that the block ID limit [BIL] was slated to be removed in the near future moving to one_block; one_ID could make sense. 2) Mnemonics: yellow_glazed_terracotta will be easier to remember than stained_glass 4. 3) There may have been a faction within the development group that pushed to hit the BIL because the then necessary expansion would facilitate other changes (e.g. the reworking of the command structure). [Pure speculation, but the effect of intramural corporate politics can not be ruled out. the kindest explanation for how 1.14 is implementing new fence/slab/etc behavior (ie. breaking builds relying on the current blocks) would be that – the removal of the BIL having served its pupose – it is now being ignored. Maybe They wanted to make Minecraft More Interesting Ah Realistic Maybe ??!! Here's a dumb question - how is it that they're running out? Yeah, I get it, wasted block IDs, but why is there a limit in the first place? Such a limit seems so arbitrary and unnecessary, but shedding some light on why it exists would make me feel differently. Because of how they saved the ID's on your storage. Here is the source for all this. Chunks are split into 16x16x16 segments. Each segment contains various arrays of byte data about that segment, with each index in the array corresponding to a physical location in the segment (so index 0 might indicate the bottom-most left block, 1 is one block over, etc). We only care about two of these arrays, the "Block" array and the "Add" array. Now the "Block" array contains 4096 bytes (16x16x16=4096=1 byte per block), where the "Add" array contains 2048 bytes (16x16x16=4096/2=2048=1 byte per 2 blocks=4 bits per block). Numerical ID's for blocks are expressed as 12 bits, which is where the 4096 block ID limit for modded comes from. The first 8 bits are stored in the "Block" array, and the last 4 bits are stored in the "Add" array. When the game reads a given position in the segment, it reads the first 8 bits from the "Block" array, then reads the last 4 bits from the "Add" array, and shifts the 4 bits over to the left by 8 positions. Then it adds the two values together to get the final, full ID. Now the problem is, in vanilla, the "Add" array is somehow disabled. Mods activate it, but Mojang has yet to. So Mojang is still only using 8 bits to store the ID, which results in the 256 block ID limit the game has currently. They could activate the "Add" array, which would raise the block ID limit to 4096 in vanilla, but 4096 is still pretty low: I ran out of block ID's with 280 or so mods in 1.7.10, when I could easily run 300+ mods on my system. So they're coming up with a new way of storing ID's, that keeps this current system in place, but extends off of it such that each individual ID is unique to the segment it's stored in. Under 1.13's system, chunk segments will also store a thing called an "ID palette", which maps textual ID's ("minecraft:stone") to numerical ID's (3). Because the palette is local to the chunk segment, it moves the 4096 block ID limit from the game itself to each individual chunk segment, which coincidentally each chunk segment can store at maximum 4096 unique blocks (16x16x16=4096), so it's impossible for a single chunk segment to run out of ID's. And that's where the whole "infinite ID" thing is coming from, under 1.13 the limit will be however many block instances an array in Java can store, which at minimum is around 2 billion or so, assuming arrays use signed 32-bit integers.